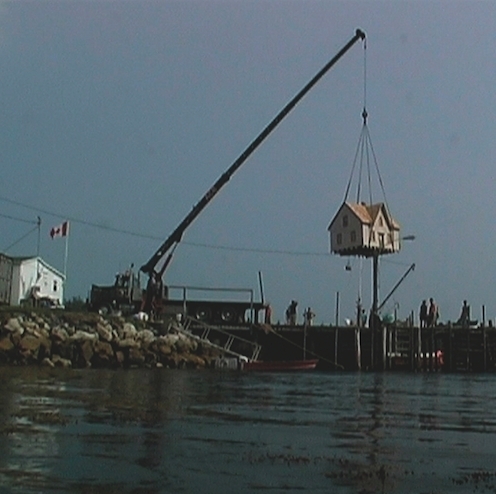 Paulette Phillips, The Floating House, 2002, 16 mm, color, sound, time TK. For the inaugural exhibition at this space, curators Olivia Boudreau and France Choinière have assembled a selection of photographs, films, and a site-specific installation that posit the concept of “home” as a place of impossible equilibrium, a space that balances precisely between comfort and catastrophe. Among works by its twenty-seven exhibiting artists, the psychosomatic provisos for residential living are at times as enchanting as they are traumatic. Joseph Ismail’s video Beyond the Pleasure Principle / High Wire, 2010, depicts the artist balancing upon the hind legs of a dining room chair, evoking an unnerving clout of an adolescent’s table manners. Those same manners have been rendered useless in Patrick Jolley and Reynold Reynolds’ film The Drowning Room, 2000: This surrealist vision of suburban living depicts a family dinner entirely underwater—gravity is irrelevant here as the cuisine drifts off plates and amity slowly shifts toward a violent and fatal animosity. Following suit is an elegantly aged 1963 Canadian public-access film Un avant-port en movement—Le long des côtes de Terre-Neuve. In its rich 16-mm black-and-white grain, a group of young men is seen manually transporting a suburban home across a Newfoundland waterway—a predecessor and mirror image of Paulette Phillips’s full-color video The Floating House, 2002, in the adjacent room. The exhibition continues nearly two miles away on Rue Saint-Denis with a satellite installation of Jennifer Campbell’s photograph String House, 2013. Hung in its grandiose stature on the facade of a historical café, the image shows a pair of hands playing with string à la cat’s cradle, skillfully organizing the outline of four walls and a roof—as if home resides only in such ephemeral gestures.